For years, Kelley Flowers, disability resource co-ordinator at the University of New Brunswick’s Fredericton campus, has been breaking down barriers for students with disabilities. Ms. Flowers was recently given the Disability Awareness Week Award from the Premier’s Council on the Status of Disabled Persons as part of the 2016 Disability Awareness Week activities. The award was presented to her by Randy Dickinson, former chair of the premier’s council. Mr. Dickinson describes Ms. Flowers as a role model for students as she seeks to improve the services on campus for students with visible and invisible disabilities. “Kelley treats all students with dignity and respect, points them in the right direction, boost them up when they are down and gives them a push forward when they need it,” said Mr. Dickinson. Ms. Flowers has been employed at the Accessibility Centre at UNB Fredericton since 1999. Over the past 17 years, she has worked with hundreds of studentswhose lives she has greatly impacted. She recalls a time recently when she received a note from a graduating student thanking her for everything she had done to push the student to success. “I do not think I would be graduating if it was not for you. I will always remember you and what you have done for me,” said the graduate. The prestigious award given to Ms. Flowers gives her hope that greater awareness is being made of the opportunities that are available to students with disabilities. The most rewarding part of Ms. Flowers job at UNB is watching the students she works with cross the stage on graduation to receive their diplomas. “I love my job and the students I work with. Watching them cross the stage on graduation day is very rewarding. I’m thankful that I can assist them to get to that very special day,” said Ms. Flowers. Established in 1988, the awards honour those who have made significant efforts to improve opportunities for persons with disabilities so they can participate fully in their communities and lead more independent lives. 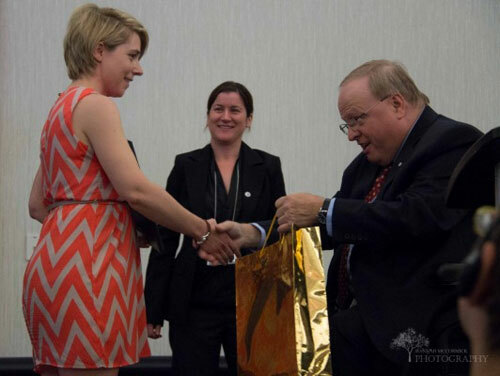 The awards were handed out Tuesday, May 31 at the Legislative Breakfast held at the Delta Fredericton.